A wet Day in March. After the retirement of Ian McCrae in August last year the club appointed Kieren Grimshaw as our new groundsman for the remainder of the season. 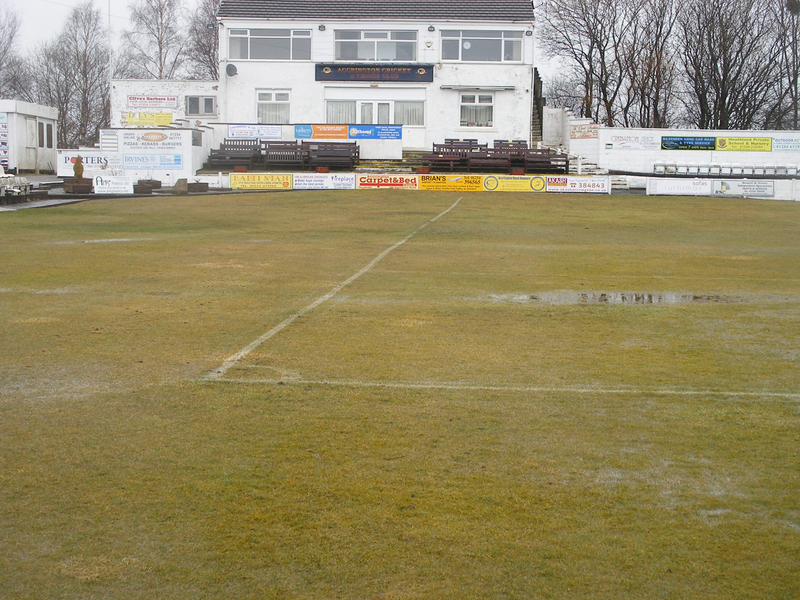 l'm pleased to say Kieren will be carrying out groundsman duties on his return from Australia. As for the winter months it’s been a testing time as far as the ground is concerned, with the weather conditions in spring having been somewhat frustrating. Rain, snow, frost and cold winds have hampered the pre season effort. At the back end of the season we top dressed and reseeded the square and the ground was put to bed for winter. All the machinery has been serviced and is now good to go, along with a bit of wheeling and dealing, a favour here or there and just some luck in some cases, we’ve managed to purchase a new wicket mower and scarifier while trading an old mower and roller to afford their purchase. The wicket mower was a bargain! I couldn’t get it in the van quick enough after paying the bloke, sometimes a cheeky offer gets accepted and it did that day. With the shed stocked and ready to go the pre season preparation was ready to commence but the Great Lancashire weather had other ideas, so preparations have been slow so bear with us as we get it fit and ready for the first weekend of the season. Pre-season rolling has been done sporadically as the weather has not allowed us to consistently work on the square. But it’s ready for Kieren’s return and it's over to him. Malcolm has been terrific as usual servicing all the machines and cutting the outfield and perimeters, Danny Chamberlain has worm killed the square and offered help and valuable advice and suggestions which I plan to take him up on as he is a fine turf specialist. It’s in these chats we have discussed the big problem “MOSS” and the need to get rid of it this year I’m determined to get this done it will mean some fund raising but I’m sure we can do it. Taking advice is from different people is good, different perspectives on situations are helpful and can help you find a solution, it’s very much like being coached or a captain asking advice, you can’t do it on your own you need observations and constructive criticism to improve, and the ground is no different. As for fund raising I would like to thank everyone who made a donation or pledge to the roll on covers and with the help of an ECB grant we will have them to use very soon. We are just waiting for ECB authorisation comes through before we can make the purchase, these covers will make a big difference when they arrive. As a club we have to keep the facilities moving forward the penny pinching has to stop and investment is required, if we have to raise the cash we will, there’s no shortage of willing workers. So please bear these comments in mind and good luck for the season ahead.